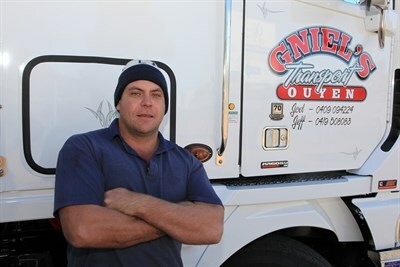 Joel Gniel had only been behind the wheel of his brand new Freightliner Argosy for 10 minutes when we caught up with him at a service station at Ouyen, Victoria. The Gniels have been involved in transport since 1962 with Joel part of the third generation. His grandfather, Keith Gniel, operated a stock crate and low loader, his first truck being a Ford Thames followed by a 1418 Mercedes. A couple more Mercedes followed then came a new R model Mack in the late 1970s. This in turn was followed by a bunch of Kenworths including a K100 Aerodyne bought new in 1982, and then a W925 that Joel’s father, Jeff, drove. "We still have the old W model and we hope to refurbish and rebuild it," Joel says. "That truck was my father’s pride and joy and he drove it for many years. It’s done a few miles now but with any ounce of luck we will get it looking like new again." A T600, also in the four-truck fleet, has good running gear and the initial plans are to use its running gear to give the old W a new life. In addition to the T600 are two Sterlings and the Argosy. "Dad doesn’t do that much driving any more. We have a farm and he does more farming these days," Joel explains. "Dad brought the Argosy down from Mildura last night," he continues, glancing at the Freightliner. "I’m on its maiden voyage to Kadina to pick up a load of sheep. "I’ve only previously driven an Argosy bobtail. The truck drives well and we’re happy with it so far, but we will see how it is after a couple of loads when we really put it to work." The previous two Gniel trucks were Sterlings, but with that brand going by the wayside, the choice was governed by cost. The Argosy joined the fleet as a matter of necessity by the addition of extra services to the small rural community of Ouyen. "There is always plenty of work. It’s if and when you get paid is an entirely different thing. We have bought other trailers and started to get into general carrying," Joel explains. Gniels do a general freight run out of Adelaide into Ouyen every week now and have initiated a similar freight run out of Melbourne. "The local mines that have sprung up have helped. It has taken Ouyen’s population from 1,500 to 1,800. They have helped us with general freight coming out of Melbourne and Adelaide. We haven’t got involved in the sand as Kalari have that all sewn up," he adds. 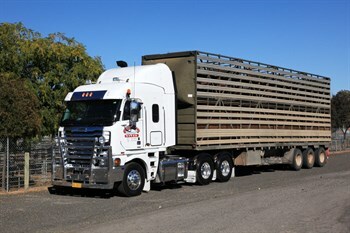 Joel is hoping the Argosy will add versatility to the fleet with the need for single trailers, B-doubles or road trains. "We do a lot of road train work through New South Wales so the Argosy will predominantly do B-double or road train work. It will do a lot of rough kilometres out in the bush." Because Gniels run up into New South Wales from their base in Ouyen, the opening up of routes around and through Mildura have been a big plus. "Some things do go your way. Before, we would have to run a trailer over to Wentworth or Tooleybuc, unhook and come back for the second trailer, so we were doing double the kilometres," Joel says. "We are about as far south that is permitted with road trains. It makes our business a lot easier, as we are able to hook-up and drive straight out of the depot. It’s a saving of fuel, time and vehicle wear and tear." While the freeing-up of routes is seen by Joel as a big improvement, the additional rules and regulations offer plenty of obstacles to a country-based carrying business. "They make things more difficult but we do what we can do," he says. "Most blokes drive to their capabilities. If they need a sleep they pull over, but with logbooks you have to sleep when it’s your scheduled time off, but you can’t if you’re not tired. "Sometimes you are encouraged to drive when you are tired, but in that case you have got to push through to make your hours work." Joel believes that the fine for log book offences is going too far. "Now it’s $750 for any mistake in the log book. That’s a week’s wage for a driver. Most of the time it’s common usual mistakes, like not ticking a box or if you make a spelling error, even though all your kilometres and hours are up to scratch. It’s a week’s wages gone," Joel exclaims. "Most blokes are trying to do their best; a little bit of understanding and flexibility go a long way." It’s that flexibility and understanding that the Gniels must show to their customers during the tough times. "We’ve had some hard times, especially during the drought. It is really tough, a lot of our work comes from farmers — stock and grain work — so if they’re doing it tough, generally we do it tough but we keep soldiering on. "In 2012 they struggled a bit. Two years earlier, another drought but things are picking up now. "Whether it’s good seasons or bad, the stock needs to be moved. You learn to be compassionate. It broadens your horizons. We are in a relatively small community where everyone helps everyone else." With the need to control costs, the new truck was bought for a price and not for its specifications. Joel would have preferred a Detroit Diesel whereas the Argosy has a Cummins. "Once again, the decision came down to cost and the dealership wanted to sell this truck. We have enjoyed a good run out of our Detroits but the price factor kicked in," Joel says. The Cummins ISX is set at 550hp (405kW). The cab is the 101 inch (2.57m) version. A bigger cab would have been nice but once again Joel had a deal on this particular truck. "We weren’t really thinking about a new truck until we saw the price of the Argosy and jumped at it," he smiles. "It’s one of those things where you need to take the opportunity when it arises." Upfront on the Argosy is a Baron bullbar. Joel likes the contoured lines of the bar and it fits in well with the lines on the grill. Back in the old days Gniel’s trucks were all painted but to keep costs down, they’ve opted for basic white. They’re also easier to keep clean, although Joel says they still end up looking fairly dirty at the end of the week. During 2012 Joel stepped up to run the transport business and his dad, Jeff, looks after their properties. Joel’s brother, Leigh, is currently helping out, but being an engineer by trade Joel thinks it won’t be long and he will head off where he can make a lot more money. Other Gniel drivers include Kevin Lunt and John Smith, as well as a number of farmers who chip in when things get busy. For Joel, he’s happy to be driving the Argosy as well as running the operation. "I have been doing this for a long time now so I thought I may as well take a bit more on board," he says. "I still enjoy driving, I really do. There are always different places, different loads and carrying everything from machinery, bulk and stock. "Being a general carrier, we have to be able to do nearly everything," Joel says. "We are an all-purpose transport operation. We keep the farmers going and they keep us going."